Casa Decrepit: What Are Those Crazy People Doing Now? What Are Those Crazy People Doing Now? Have you ever had one of those things going on in your house where you could not adequately describe it without a graphic? That's the last two weeks for us. We decided to get a roommate, asked a friend who might need a place if he'd like to move in, and he accepted. His name is John. He doesn't know much about home improvement. He is learning, poor soul. Unfortunately, John had to move in with us, and as usual we were perpetually behind schedule on our projects. 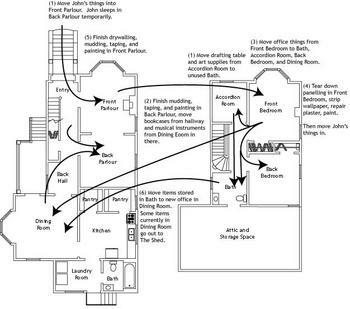 So we had to come up with a strategy for getting a room ready for John and getting the house in some semblance of order for my disappearance in the fall (when I go off to architecture school at Calpoly San Luis Obispo). Stage 1: We move all of John's things into the Front Parlour. All the crap previously dumped in the Front Parlour, including several large batts of insulation for the basement, gets dragged out in the night and stored under the house or in the yard, or outright thrown away. In this stage, a minor panic sets in and we manage to fill a mini-dumpster with assorted items that we're not going to need for at least four weeks. We also move all the drafting things out of the Accordion Room and into the upstairs Bath, which turns out to be a much larger inconvenience than expected, as it blocks access to the attic. John camps out in the Back Parlour while Stage 2 goes on. Once we have finished the Back Parlour, we move the bookcases from the hallway, and the musical instruments from the Dining Room (that'd be a piano, an electric organ, a harpsichord, and a keyboard) into the Back Parlour and close the door in relief. John still has to sleep there, though. Stage 3: We move all the stuff that is in the office down into the Dining Room, and out into the upstairs Bath and Back Bedroom, and into the Accordion Room. This allows us to move to Stage 4. 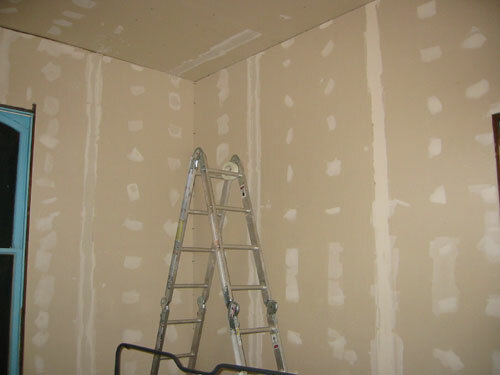 Stage 4: When asked, John requested the removal of the horrid fake wood panelling in his room, too (note that we still haven't finished our own room; we moved everything back in and are camping out there until September or later, when I have time to get to it). So Stage 4 is to tear down the panelling, strip wallpaper, repair plaster, and paint in John's room. Stage 5: Finish the drywalling and so forth in the Front Parlour. When that's done, we have a living room at long last. Stage 6: Move everything out of various hidey holes into the Dining Room as needed. We plan to remove the panelling there, too, but not until I'm home for Christmas break.